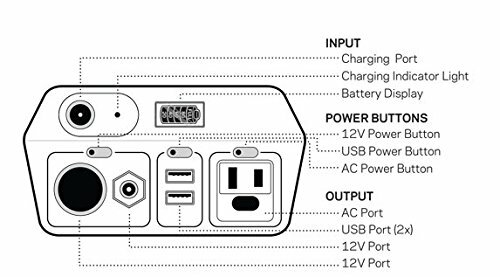 The Yeti series of portable power stations from Goal Zero are pretty amazing. They are portable, off the grid power solutions – for modern times. These are a far cry from the old school, gas-powered generator. Goal Zero describes them as generator alternatives. 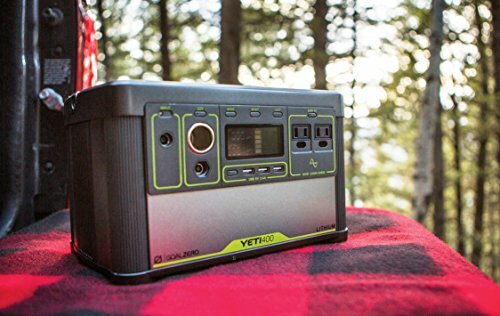 The Goal Zero Yeti line combines efficient and powerful modern battery technology with innovative charging options. And they are built to power the devices of today – phones, tablets, computers, and household appliances like microwaves, TVs, refrigerators – and more. And whether you need an emergency power blackout option, power options for remote recreation, or robust power for the job site – there is a Yeti product that’s right for you. We’ll look at the whole range of options – from compact to heavy duty. 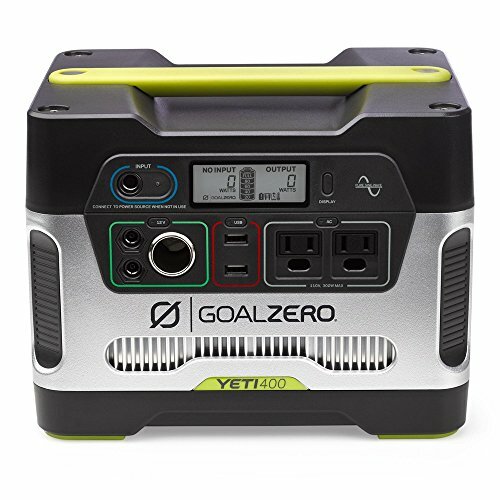 In this article we’re going to review Goal Zero’s Yeti products that use AGM Lead-Acid battery technology. Lead-acid batteries are traditional batteries – like that in your car. They have some drawbacks – they are heavy, they need to stay fully charged when not in use. BUT, they are significantly cheaper than the more advanced (and lighter) Lithium technology. Let’s deep dive into these products here. Lithium or lead-acid – what’s the best battery tech for you? Lead-acid is the same technology as your car battery – it’s heavy, it involves acid, but it is high capacity and relatively affordable. You also need to keep them fully charged at all times for best battery life. They are more expensive as compared to lead-acid. 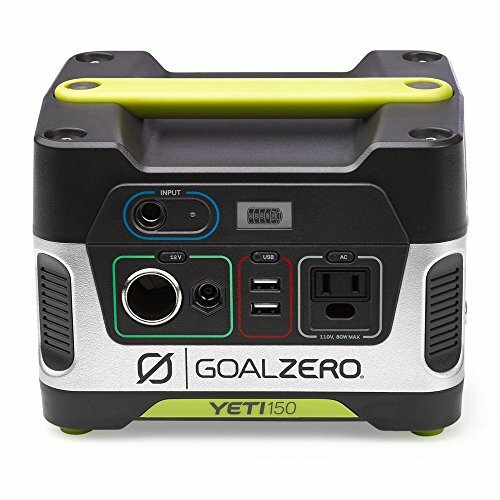 The Goal Zero Yeti 150 (Buy on Amazon) power station is the entry level, battery based power solution. First of all, what is it exactly? It’s a mega-sized battery (lead-acid type). You charge it up by connecting to a wall outlet (or use solar panels) and it provides lots of power. Assuming it’s charged up – just plug your devices into the built-in power outputs. There’s two type of 12V outlets – for car accessories, two USB Ports, and an 110V AC outlet – for very small household accessories – like phone chargers and laptop power bricks. And because it’s a battery – just hit the power button and go – no fumes, no noise – it’s totally silent. Capacity 150Wh, 14Ah (12V) battery capacity. This particular Yeti model uses a lead-acid battery, just like your car. For best results, when not in use for remote power, you should leave it plugged into the wall – as that will maximize life for this type of battery. That also means you shouldn’t drain it all the way down – it’ll last longer if you don’t do that. The Goal Zero Yeti 150’s sweet spot is camping and recreational activities. Keep phones charged, recharge camera batteries, or charge up your laptop. The fume free, silent operation means you won’t disturb mother nature. How much practical power does this provide on a full charge? As you can see, the Yeti 150’s specialty is SMALL devices. You shouldn’t try to run household appliances off this unit. The Goal Zero Yeti 150 is a neat solution – for small power needs. If you need more power – like for light household appliances, let’s look at it’s big brother. The next step up in the Yeti line is the Goal Zero Yeti 400 (Buy on Amazon). This model is similar to the 150 – AGM Lead-acid battery, a variety of power outputs, and multiple ways to charge. The big difference? It’s bigger. Capacity is 400Wh, 33Ah (12V). That’s significantly more than the 150. Capacity 400Wh, 33Ah (12V) battery capacity. Again, this is a lead-acid battery – keep it on the wall charger when not in use – and don’t drain it down all the way. If the Yeti 400 is not enough power for you, we have one more lead-acid option. The Goal Zero Yeti 1250 (Buy on Amazon) is a portal power solution that you can charge with wall power or with solar panels. At the core of the solution is an amazing battery. This is a portable power solution for the year 2019. It’s got 1200Wh (100Ah) capacity – that’s a lot. For powering everything from phones, to laptops, to a refrigerator – this is a great emergency power solution. Or, if you need an outdoor, remote power solution – for camping, working, recreation – or anything else. We mentioned this isn’t an old fashioned gas powered generator – with all the fumes, noise, and danger of gasoline. Here’s the real beauty of this solution – the diverse array of charging options. How do you charge it? From wall power, car charger, or even solar panels. Doesn’t that take a while? Not as long as you’d think. Here’s charging options for the 1250, and the time it takes to a full charge. What can you power with the Goal Zero Yeti 1250? Here’s the outputs – plug in any USB device with ease. It can also power any standard 12V car accessories. And lastly, it has an inverter built in to give you good ole 110V 60HZ AC power – via 3 separate outlets. Use that for a microwave, coffee maker, tools, lighting, or even a refrigerator. Yep – and this one is no exception – the Yeti 1250 weights about 103 lbs. Heavy, but not unmanageable. Included in the package is a roll cart. How long will these appliances last? That will depend, of course. You won’t be able to drive a power draining device as long as a smaller one, of course. This portable power solution also works best in above-freezing temperatures – battery performance is impacted greatly by temperature. Can you power a full size refrigerator? Can you really power a full-size refrigerator with the Yeti 1250? “Full-size refrigerator runtimes from the Goal Zero Yeti 1250 are dependent on several factors, including the year, make and model of your refrigerator, as well as its volume, fullness and usage. How Could You Use a Yeti 1250? What are some example uses of the Yeti 1250? 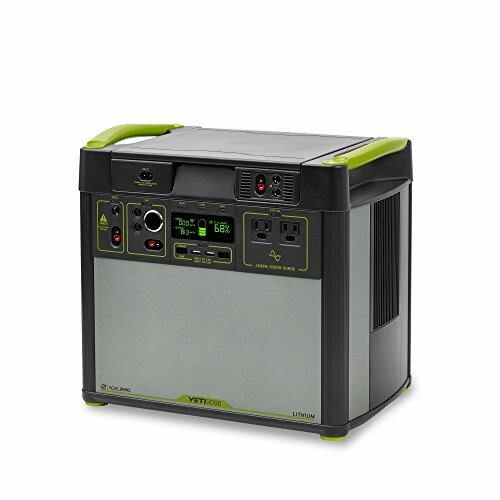 Emergency power for hurricane season, or blackouts and power outages. Remote power for construction and projects – no more running extension cords. Plenty of power for camping – be the campsite hero with a coffee maker, a microwave, and more – without disturbing the peace. Power a tailgate party – and much, much more. Let’s take a look at my favorite charging solution – Solar Panels. Harness the power of the sun – and get off the grid. 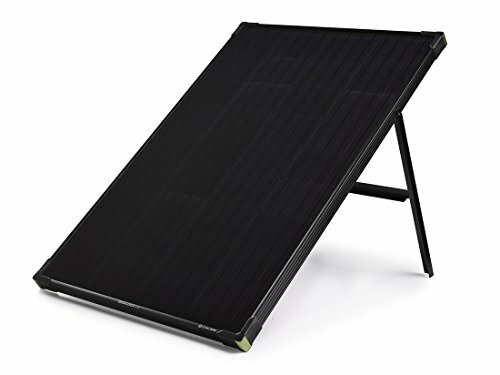 The Boulder 100 Briefcase Solar Panel (Buy on Amazon) is a 100-watt monocrystalline solar panel, that folds into a brief case form factor (with carrying handle) for ease of transport. It also has an integrated kickstand to help get the optimal angle to the sun. 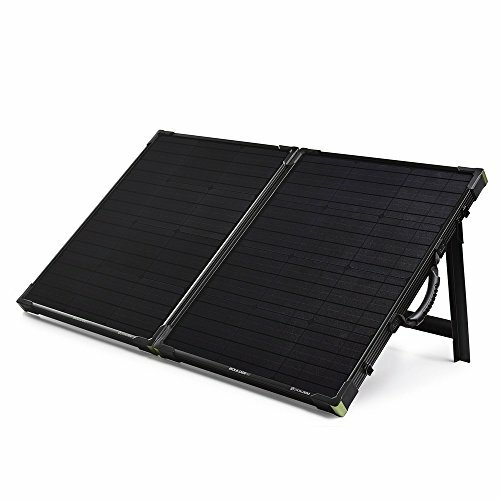 The Boulder 100 solar panels can charge your Yeti 1250 in 18-48 hours – depending on intensity of sunlight. Do I need sunshine to use solar panels? This might be a surprise – but solar will work without direct sunlight, even in overcast conditions. That’s because solar panels utilize IR, UV, as well as the visible rays from the sun. The IR and UV light can easily penetrate cloud cover. Cloudy conditions will mean less efficient charging – but it doesn’t mean you are dead in the water! Is it hard to setup? Nope – it includes a 5 foot cable to connect directly to Goal Zero products – like the Yeti 1250. And, they are easy to transport securely, it folds up like a briefcase, complete with carrying handle. Step up to the Boulder 200 Watt Briefcase Solar panel (Buy on Amazon) for even quick charging. Will solar panels work indoors? Yes, but they will work much better with direct sunlight. The glass pane of a window will significantly reduce recharging efficiency. Solar panels should be placed outside, in direct sunlight – if at all possible. Keeping the solar panel angled directly to the sun is also recommended – that’s when solar panels will work most efficiently. Want an emergency or remote power solution that is clean, easy to use, and powerful? 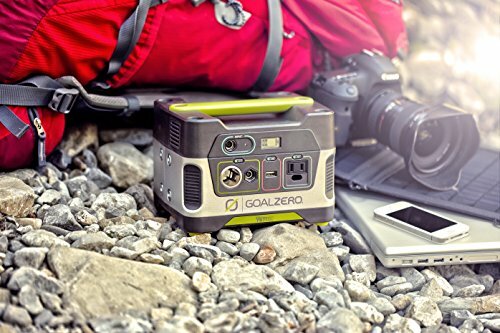 Then you want the Goal Zero Yeti Portable Power Solutions. Their Yeti products that are based off of lead-acid batteries are heavy, but have high capacity, and are affordable. Team them up with the Boulder Solar panels for a true off-grid, green, and clean power solution. Silent, no fumes, and plenty of power. 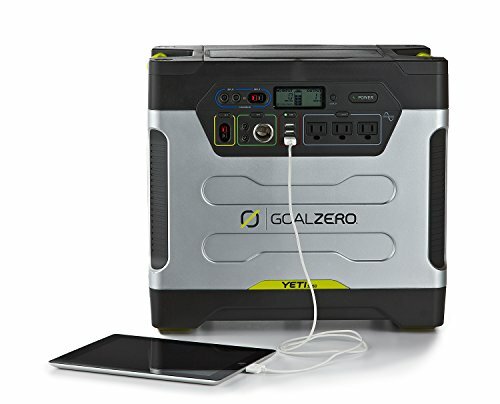 You may also be interested in our review of Goal Zero’s Lithium based Yeti Power Stations.